Hosai II (1872-1934), was born Sadakichi, in Tochigi as the first son of Hosai I. Early on, other bamboo artists honored him as "Master"
In 1902, Hosai II inherited the name Kikuji from Hosai I. Although his original style was still clearly karamono in origin, Hosai II produced amazing baskets in his own style using highly developed technique. 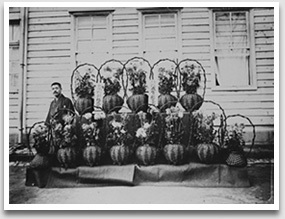 In 1910, Hosai II moved the family to Tabata, in Tokyo and started working and living there. In 1925, his entry ���`��� Oigatakikyoku received a honorary prize in the Paris World Fair of Ornamental Arts and Crafts. The Japanese government had provided a subsidy for production of this piece. 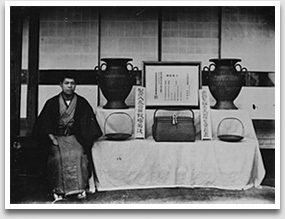 Hosai II also received a number of prizes in other exhibitions, such as ones sponsored by the Ministry of Agriculture and Commerce. At that time, bamboo crafts were seen as a commercial endeavor of industrial production. However, Hosai II gained the respect of other artists, establishing the dignity of bamboo artists, and opened the door for further development of the field of bamboo arts for Rokansai and following generations of artists.